After Sara’s fruit salsa a few weeks ago, you should be well-acquainted with the idea of Choose Your Own Adventure cooking! What it REALLY is is getting to a point where you’re comfortable enough in the kitchen to play around with different flavors and figure out what you like. So if you think of something that’s not on our list here, give it a shot! 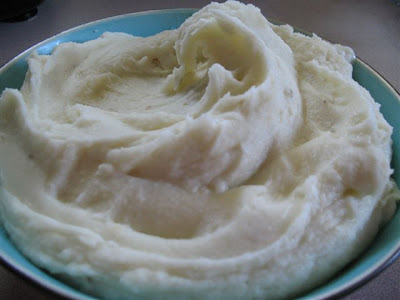 –You can use any kind of potato you want for mashed potatoes; however, different potatoes will yield different results. The starch content is higher in Russet potatoes, so they build up into fluffy, light mashed potatoes whereas red and Yukon gold potatoes will be pretty creamy, but they can border on runny if you’re not careful. –If you use Russets, it’s probably best to peel them, or at least most of them–their skins tend to be tough and unpleasant in mashed potatoes. If you like skins, feel free to leave them (or most of them) on red or Yukon golds. –Plan on about 1 fist-sized potato per person. Extra potatoes are never a bad idea. –Bring a large pot of salted water to boil. 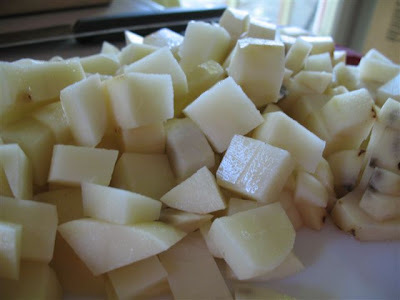 While you’re waiting for it to boil, chop potatoes into approximately 1/2″ cubes. They might seem a little small, but it ensures uniform cooking and it makes things go a LOT faster to have the potatoes chopped into smaller pieces. The Big Question: Classic or Wild? There are mashed potato purists and there are those who like to walk on the wild side. There are some who are a little both. Take me–I like classic mashed potatoes on Thanksgiving and wild mashed potatoes the rest of the time. What will you need for classic mashed potatoes? Butter, milk, salt, and pepper. Going Wild? Choose the Adventure! 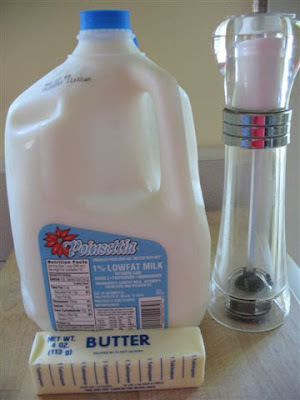 Liquid; milk or buttermilk work great. 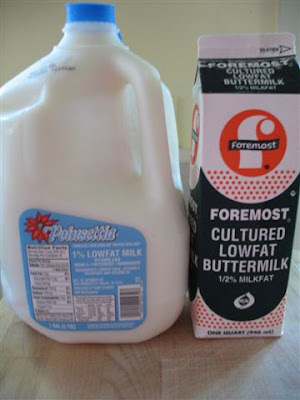 Buttermilk sounds a little weird, but it adds the flavor of sour cream without all the thickness. If you’re really feeling kooky, you could use whipping cream or half and half. Seasonings; roasted garlic, a clove or two of finely minced fresh garlic, smoked paprika, salt, pepper, garlic salt, etc. 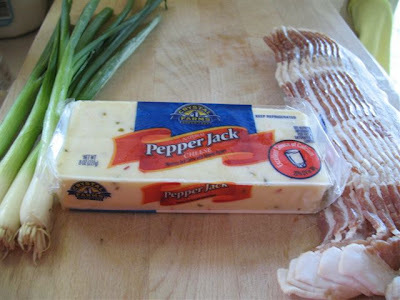 Extras; bacon, cheese (shredded sharp cheddar, blue cheese, or shredded pepper jack work great), chopped green onions, chopped chives, etc. When you can easily cut a piece of potato with a fork (and for mashed potatoes, it’s FAR better to overboil them than to underboil them), drain potatoes (don’t rinse!) and place immediately in a large bowl, preferably of a heavy-duty mixer (although you could use a good electric hand mixer). Add about 1-2 tsp. of butter (more if you want to) per fist-sized potato and mix on medium speed with the wire whisk attachment. If you’re adding cheese and want the cheese to be melty, go ahead and add it now (save it for later if you want visible shreds of cheese). Slowly add enough milk or buttermilk to achieve a nice, fluffy consistency. Turn speed to high and add desired seasonings. When the potatoes have reached the level of fluffiness you like, go ahead and add any additional add-ins while mixing on low. Adjust as necessary and serve immediately. Yummy yummy yummy yummy yummy. So is there anything I left out? What do y’all like in your mashed potatoes? Are you purists or do you play with your food? I love the classic version with some roasted garlic added. mmm. oh yeah. my husband doesn’t like potatoes. picky eater . . . my kids are doomed. When I’m old and have no teeth I would like to live off of mashed potatoes!! Eating a bad, pasty version of mashed potatoes(made by other people of course!!!) totally ruins the meal so thanks for the tuturial. a few years ago i saw a suggestion in a magazine to add a tablespoon or two of cider vinegar to mashed potatoes. we tried it and loved it so much we have added it ever since! it’s not overpowering at all but just adds a tangy,yummy taste. mmmmm…love mashed potatoes. Sometimes we put Parmesan in them. They are so good! I love salty cheeses though. And I do usually but buttermilk in mine! I enjoy potatoes in any form! I do believe, however, that some form of garlic is absolutely necessary no matter what! I use a pressure saucepan to cook the potatoes and they cook in no time flat. And you only have to quarter the potatoes because they cook so quick. And I also hate finding random chunks of potato that didn't get mashed with beaters, so I use a potato ricer, which ensures that they turn out chunk-less. We found a great recipe for garlic mashed potatoes in a Nordstrom cookbook (our favorite) and it has become a family staple. Add chopped garlic to the water during boiling. During whipping add heavy cream, sour cream, salt and pepper. I’m sure they will kill me someday but it’s worth it! I just made some mashed potatoes with kale and garlic. Delicious! I agree, roasted garlic, yum, throw in some cream cheese and feta along with it, perfection for me! Late night I dressed up some leftover mashed potatoes with bacon and cheddar. Yum yum. Remember that time we spent hours peeling and chopping potatoes and onions while listening to sappy love songs and crying? Now I have that stuck in my head. Classic! Mashed potatoes are a favorite! I love to make them with butter, milk, sour cream and rosemary. Yummmmmm! I am preggy and totally dying for those right now! I always add a few bayleaves to the water when I boil them and add creamcheese to them along with butter and whole milk- SOOOOO good! I usually add parmesan and garlic too though! 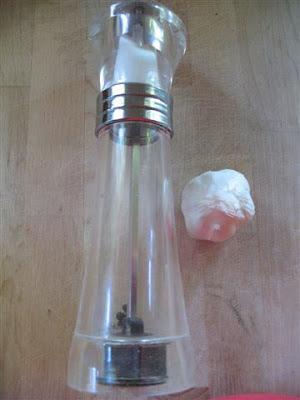 I’m gonna try feta now…thanks for the idea Katherine! We do cream cheese and garlic mashed potatoes around here, always with the skins. I'm serving them tonight with fauxtisserie chicken. I am new to your site but LOVE it! I am not great at many things but one thing to which I give myself MUCH credit is my mashed potatoes. Your's sound amazing and I am excited to try them. I thought I might give you a word of advice…if you rinse the potatoes after they are cut up it gets rid of some of the starch. I do this a few times until the water they are soaking in is clear and not cloudy. 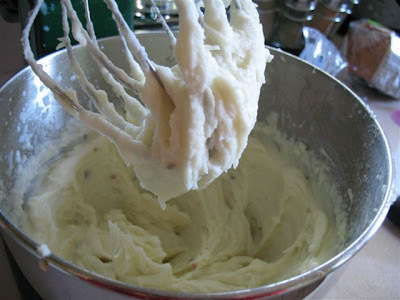 This helps to make them extra smooth as sometimes potatoes can become gluey from over-mashing or reheating. Works like a charm!! Thanks for your site! I NEVER ever EVER boil my potatoes, I bake mine in the oven and hot out of the oven mash them. They are a lot more flavorful. Boiling them takes a lot of flavor and nuritents away and makes the flavor rathr bland requiring more salt and extras. I like using a couple of bay leaves in the boiling water and then mashing the potatoes with cottage cheese, garlic, butter, and herbs. Then I put them in a pyrex dish and bake them for a bit with paprika on top. Sooo yummy. Great for potlucks! thank you so much for this tutorial. i am starting to "practice" my recipes for thanksgiving this year. i feel so empowered! Just found your website today as I am a Silhouette user. Mashed potatoes @ my house are red,unpeeled with lots of garlic. Met a guy in NC this summer who loves to cook and told me he only uses Yukon gold, cooks with the skins on and then puts them through a food mill before adding hot cream and cold butter. He also mixes in shredded guyere and then bakes in individual "crocks". They were yummy. quick question…do you cover your potatoes when you are cooking them or leave them uncovered? i know, silly question. I love to leave the skins on my potatoes and instead of Milk I use sour cream. And ocourse cheese! If the mixture is too think I may use a splash of milk. My family goes crazy over these potatoes. I love the flavor of garlic, so my chef friend taught me a neat trick of when you are boiling the potatoes is to add cloves of a garlic to the water while they cook. I usually add about 6 cloves since I love garlic. YUMMY! Any ideas why my yukon golds turned glue-like? So sad! Didn’t taste bad, but my hubby suggested we do paper mache after dinner – boohoo! I do have ideas, haha! That’s actually why I recommend russets; they have the highest starch, so they make fabulous mashed potatoes because they get light and fluffy. Reds and yukons are pretty and taste great on their own, but they kind of make glue-y mashed potatoes, especially if they’re not boiled quite long enough. If you’re dead set on using yukons, I’d boil the heck out of them next time. Otherwise, I’d use russets. This looks so delish!! 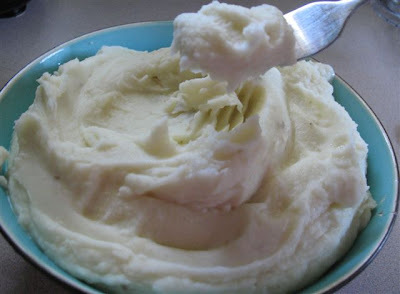 My mom and I started out with the basic recipe, but we have found that adding some garlic, a little more milk, and french onion dip makes for some WONDERFUL mashed potatoes!! They are simply my favorite! Quick question–I’m making basic mashed potatoes tomorrow night but I have to leave and pick up our dinner guests (Sister missionaries!) right at dinner time–can I chop the potatoes immediately before leaving or will they go brown in that half hour? Thank you! !